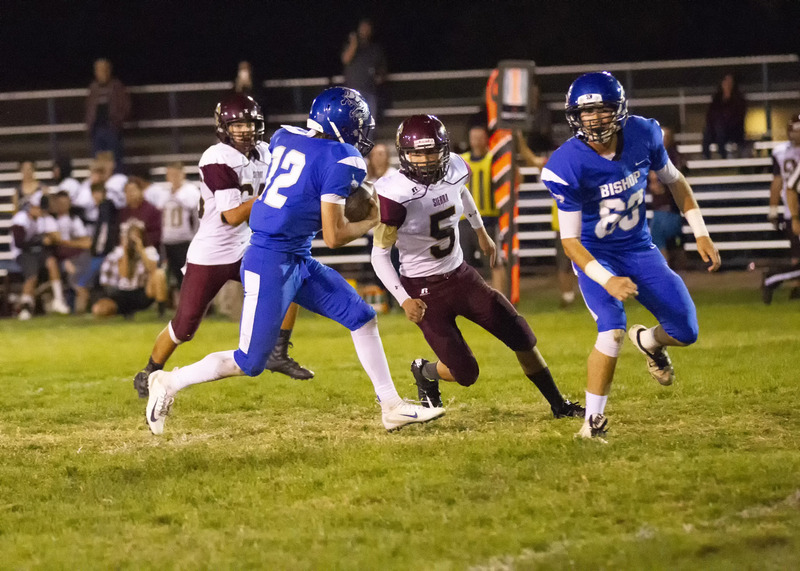 Bishop CA– The Bishop Broncos football team impressed mightily against Sierra, winning 61-0 for their largest margin of victory this season. In the first half, Broncos quarterback, Luke McClean was the standout player. 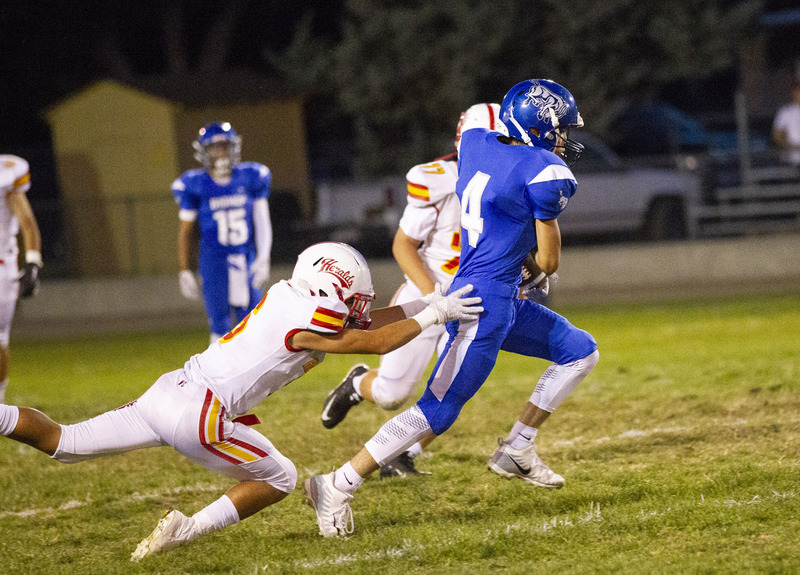 McClean hooked up with receiver, Jayden Braithwaite for a touchdown on the team’s second possession. 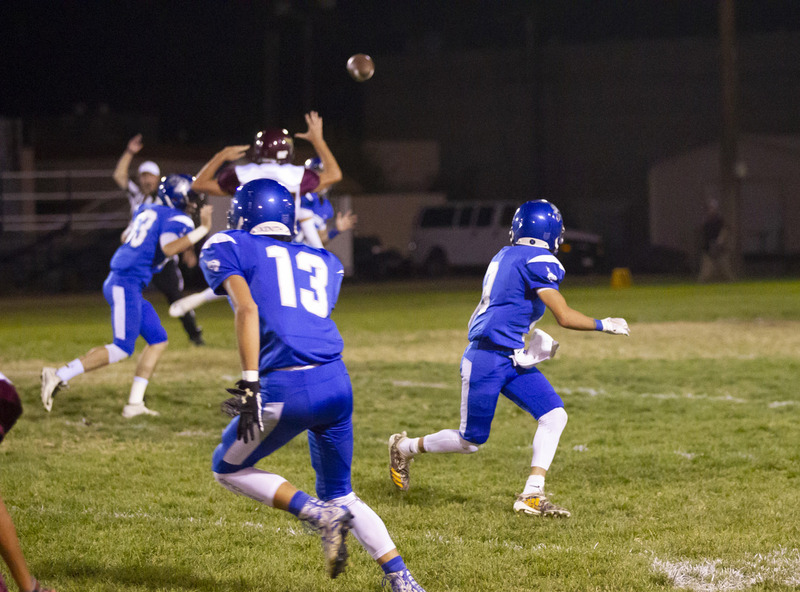 On the next drive, the Junior quarterback was able to score by bursting up field though multiple Chieftain defenders for a 30 yard rushing touchdown to make it 14-0 in favor of Bishop. McClean ended up finishing his night with 125 total yard and two touchdowns. 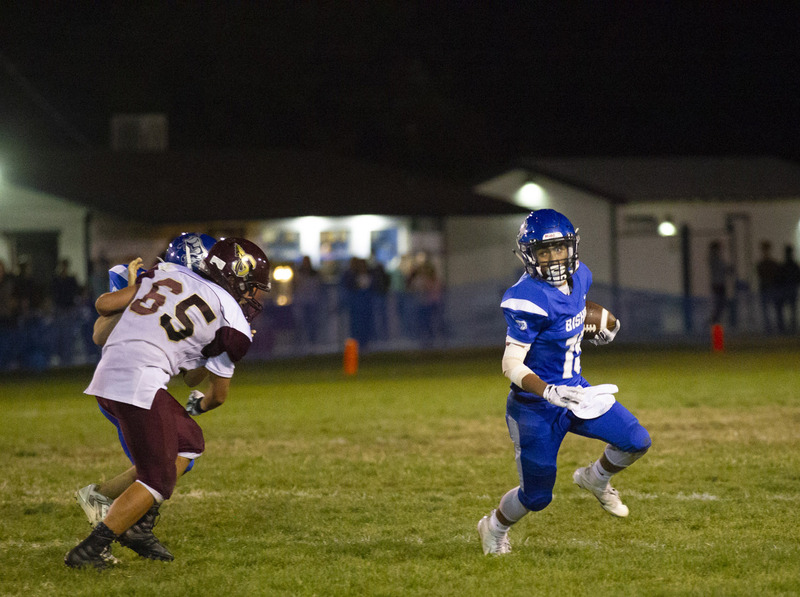 The team’s ground attack was headed by Steven Paco, who had 127 yards on 12 carries, as well as 3 touchdowns. Head coach, Arnie Palu said that Paco had a “breakout performance” and was impressed with the way the young ball-carrier handled a sizable workload. Defensively, the Broncos looked just as good as they did on the other side of the ball. 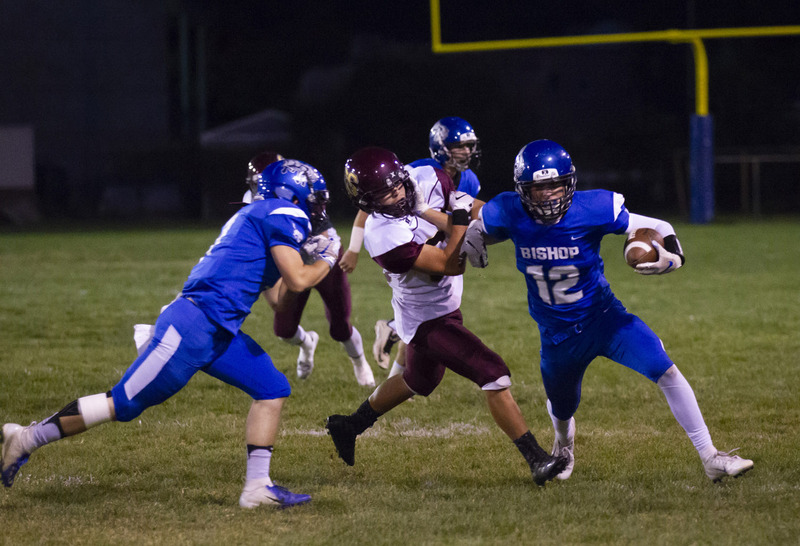 Bishop were able to get into the backfield regularly, disrupting the team’s timing of the Sierra offense. 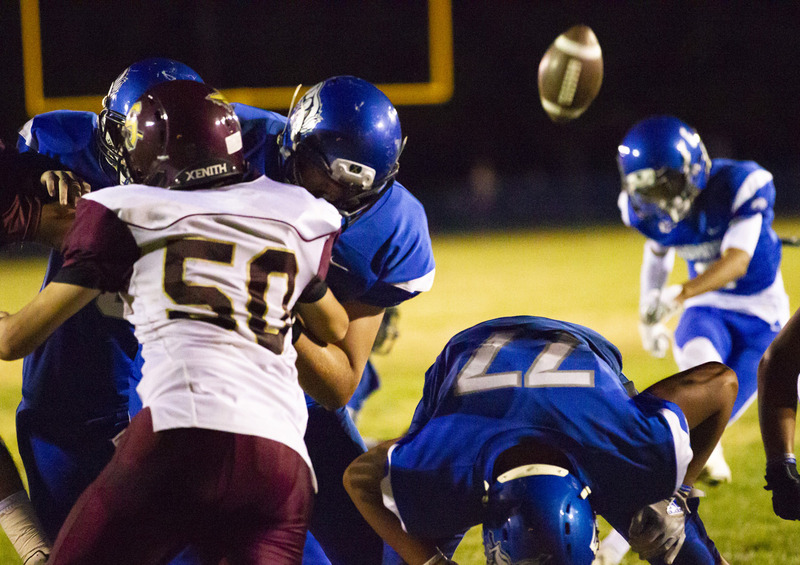 The great defensive line play helped Mark Mayhugh wreak havoc in the secondary. 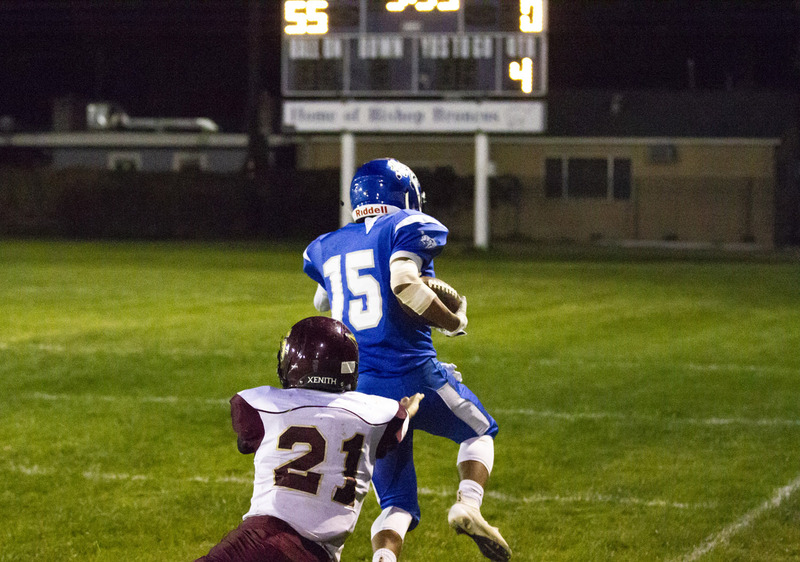 Mayhugh had 4 interceptions, returning one of them to the house for a 30 yard pick-six. 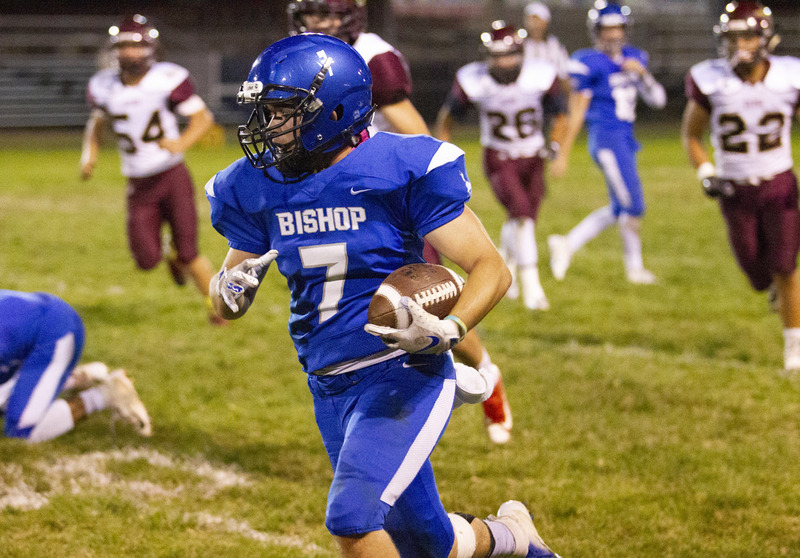 The Broncos improved to 4-2 in the regular season, and are on a three game winning streak, which is the first time Bishop Union have been able to accomplish such a feat under Arnie Palu. 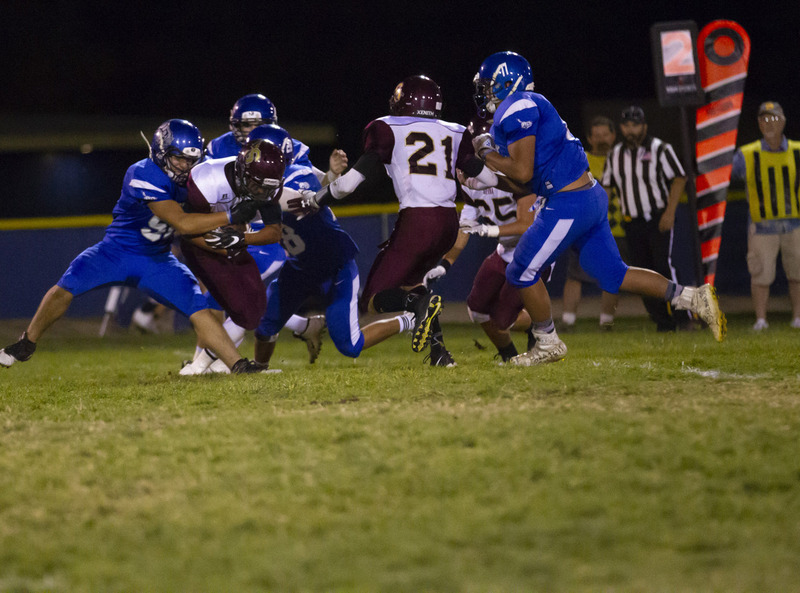 League play begins next Friday at Kern Valley next week. Kickoff is set for 7:00 PM. On March 16, 2016 the BUHS Varsity Mathletes competed in Trona in their fifth meet of the season, and won first place. 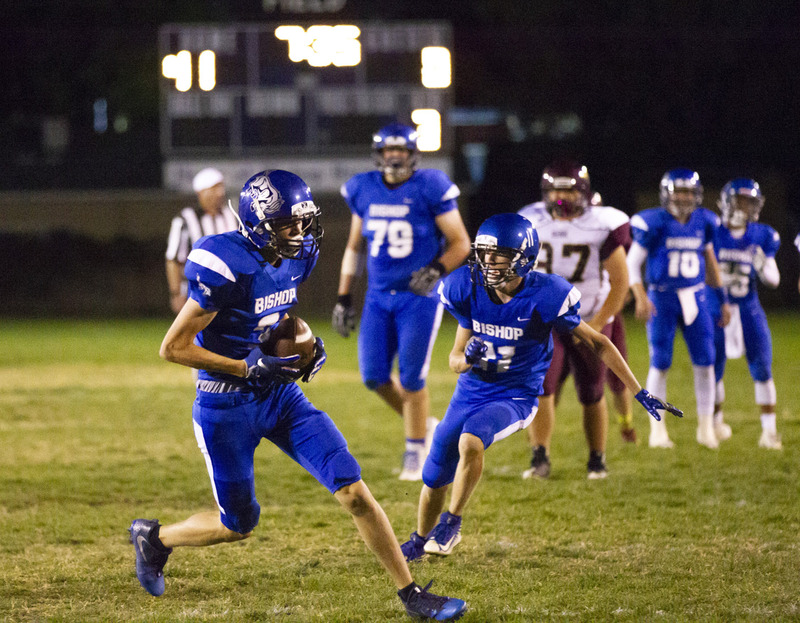 Leading the winning Bronco team was senior Jamie Shultz with seven points, followed by Liam Grah with six points, and Duncan Reid and William Moore with five points each. Sam Hess, Dezert Kiddoo, Makayla McDevit, and Alan Torres also contributed points to the winning team score. Shultz’s score earned her a third place individual finish, and Grah earned a fourth place individual ribbon. Nine teams and 64 students competed by individually solving difficult math problems in a timed setting to earn points for their team. The following problems, taken from the competition, are typical of the types of questions asked: (1) Joe Kemist has 10 liters of a 35% acid solution. How much water must he add to create a 30% acid solution? (2) From a standard deck of cards, five are picked. Find the probability that if the first card is the Ace of Spades, then the next four cards will be black. Only one meet of the year remains, with Bishop currently in first place for the league. 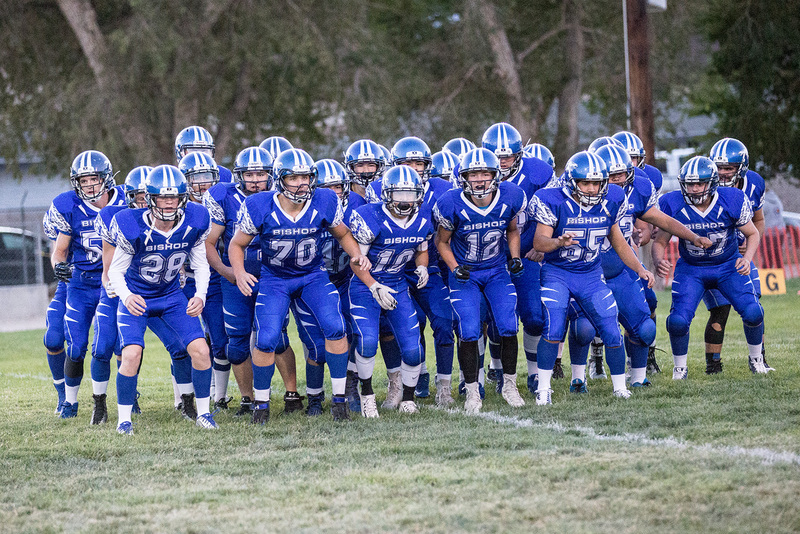 Coach Buchholz said, “I believe this group of kids can definitely bring home a league victory for BUHS. This team wants to win and they have tremendous drive. I am really proud of them.” The final meet will take place at BUHS on April 20, 2016. 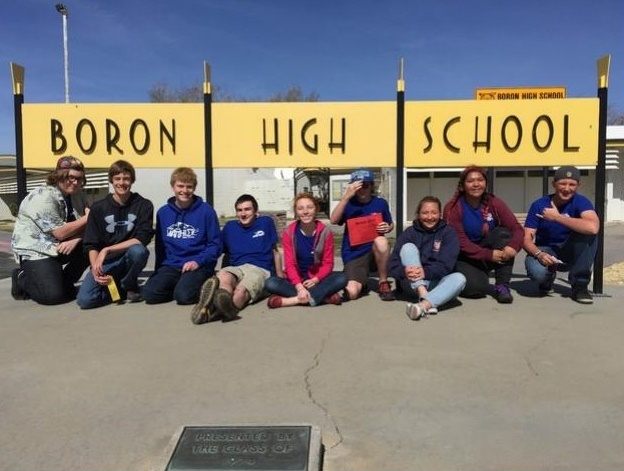 On February 24, 2016 the BUHS JV Mathletes traveled to Boron for their last meet of the year, and brought home a second place team win. Out of the eight schools competing, Desert won first place win with 33 points, followed by Bishop with 24 points, and Tehachapi finished third with 20 points. Sixty students competed in total, individually solving difficult math problems in a timed setting to earn points for their team. BUHS was led be a strong performance from Carter Silva, who earned seven points to take home second place in the overall meet. He was followed by Jim Tomasek with six points and a third place overall meet finish, and Nathan Gardea with 5 points and a fourth place in the meet. Dylan Fitt and Arianna Pope each scored four points for a fifth place meet finish. Also contributing points for the team were Jeanine Lomaintewa, Jake Graves, Tami Lee, and Joey Proeger. Bishop Union Bronco Basketball played weekend tournaments in the central valley this past weekend. The Bronco boys finished as runners up in the Corcoran Tournament while the Bronco girls finished in 5th place in the George Glover Memorial Tournament held in Strathmore. Bishop Union High School’s boys basketball team lost in the small-school championship game of the Corcoran tournament. 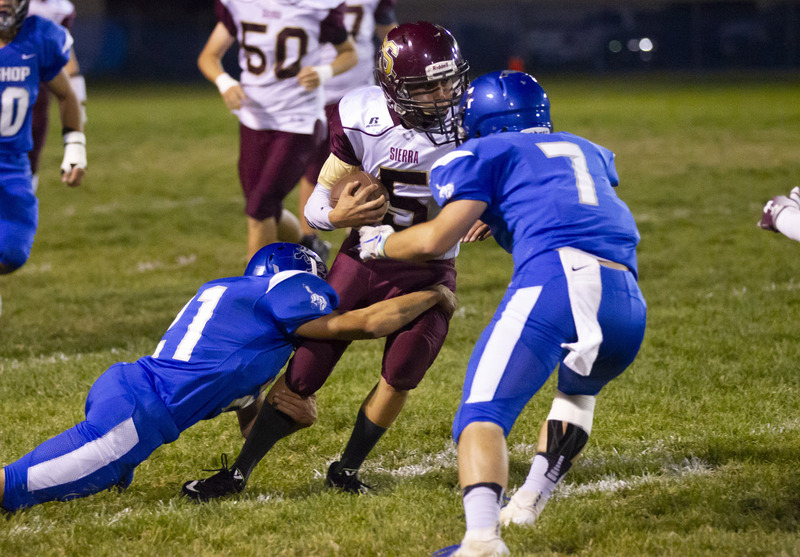 The Broncos fell to rival Kern Valley in the championship game, 65-53. 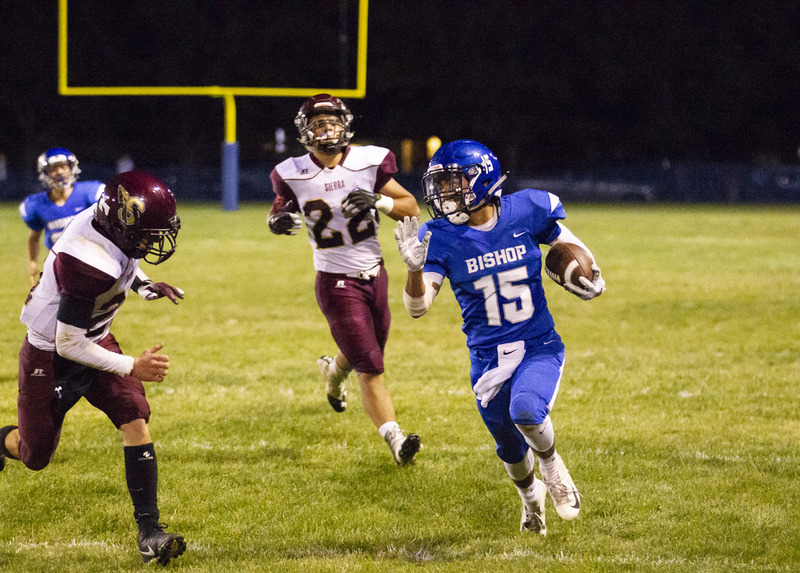 Bishop Union will get two more chances with Kern Valley during High Desert League play. The Broncos opened the tournament with a 68-50 win over Corcoran. Bishop Union then downed Farmersville 70-61 with Andrew Allen leading the way with 18 points. 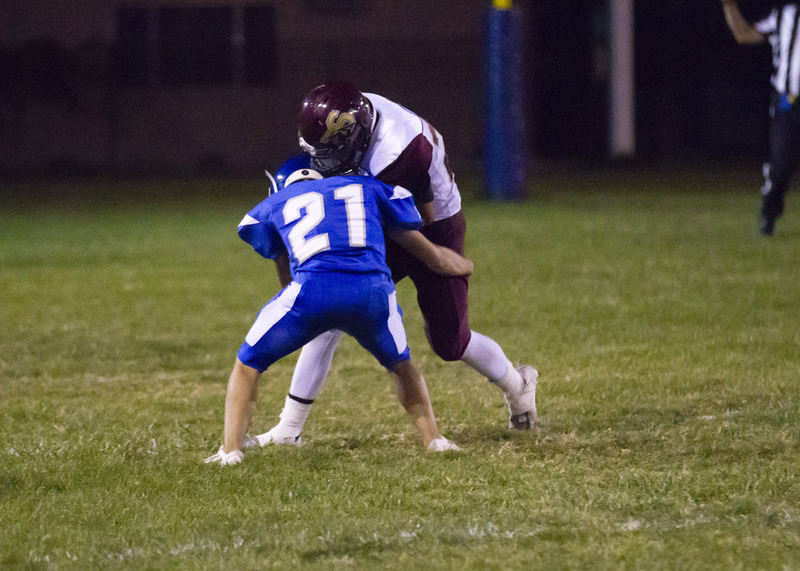 The wins over Corcoran and Farmersville placed Bishop Union in the small schools championship game with Kern Valley. Scoring, Andrew Allen, 18. Mike Molina, 13. Tommy Ruelas, 13. Anthony Vega, 11. Sean Brown, 8. Ziggy Armitage, 3. Daniel Olsen, 2. Joel Talamontes 2. 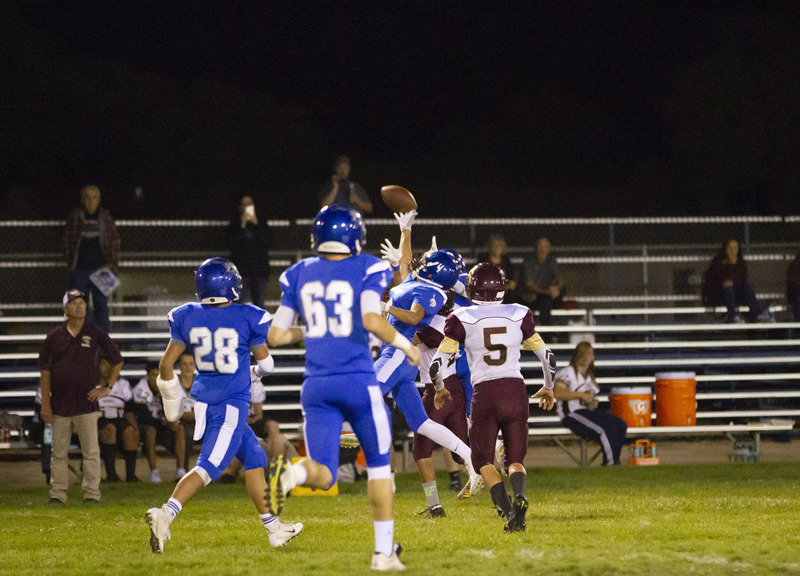 Scoring, Sean Brown, 17. Mike Molina, 12. Andrew Allen, 10. Ziggy Armitage, 6. Daniel Olsen, 5. Tommy Ruelas, 2. Anthony Vega, 2. The Bronco varsity Girls were on the road to Strathmore this weekend. Strathmore is located just to the south-east of Visaila. Bishop Union’s girls finished 2-1 in the George Glover Memorial Basketball Tournament bringing home 5th place. Maria Jimenez was named to the All-Tournament team. Scoring, Maria Jimenez, 12. Cienna Martinez, 8. Liitle Eva Lent, 5. Topah Scherer, 5. Sabrina Barlow, 4. Drew Dondero, 1. Scoring, Topah Scherer, 12. Cienna Martinez, 11. Little Eva Lent, 6. Maria Jimenez, 4. Sabrina Barlow, 2. Scoring, Little Eva Lent, 18. Topah Scherer, 10. Sabrina Barlow, 9. Maria Jimenez, 8. Cienna Martinez, 3. Drew Dondero, 1. Bishop Union High School basketball will play host to Mineral County High School Tuesday (December 15th). JV girls and boys at 3pm and 4:30 with the varsity girls and boys to follow at 6pm and 7:30 in Gus Klekas Gymnasium. 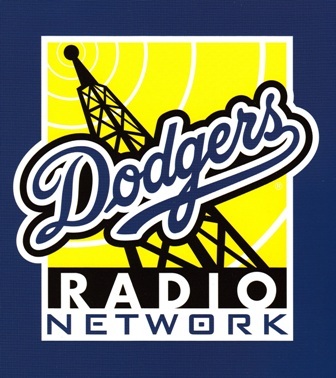 AM 1230 KBOV will broadcast the varsity boys High Desert League games starting with Rosamond on Friday, January 15th.